Epicondylitis is a chronic symptomatic inflammation of the forearm tendons at the elbow. 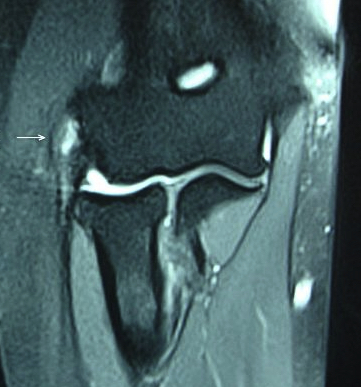 It is an overuse syndrome in the elbow, caused by microtears in the tendons attaching to the epicondyles of the elbow following repetitive injury. It affects males and females equally, with a peak onset between 35-54 years old. There are two common types described: lateral epicondylitis (or “Tennis elbow”) and medial epicondylitis (or “Golfer’s elbow”). Lateral epicondylitis is the more common, affecting 4-7 people per 1000 per year. This article predominantly focuses on lateral epicondylitis (medial epicondylitis is described in brief at the end of this article). 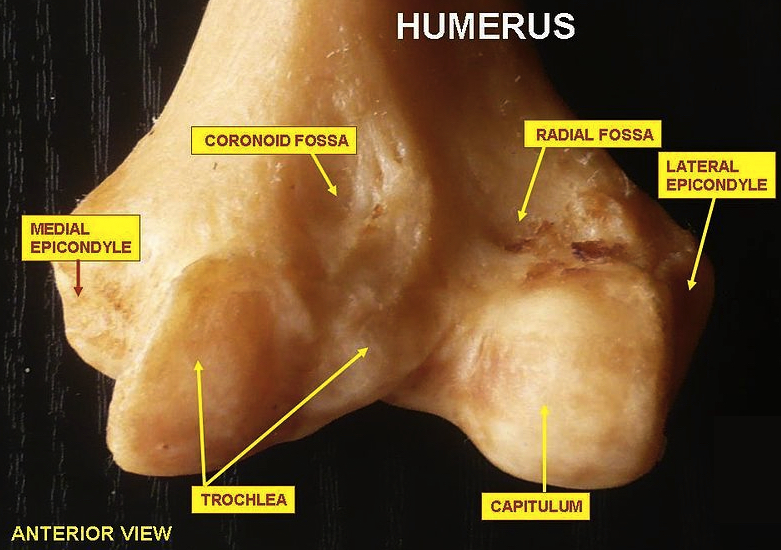 The medial and lateral epicondyles are small bony tuberosities on the distal end of the humerus (Fig. 1). The common extensor tendon attaches to the lateral epicondyle, acting as the common attachment for the superficial extensor muscles of the forearm. Repetitive overuse of the tendons can cause microtears in the tendon at their origin; the tendon adapts to the multiple tears, leading to the formation of granulation tissue, fibrosis and eventually tendinosis. The main feature is pain affecting the elbow and radiating down the forearm. The pain typically worsens over weeks to months, most often affecting the dominant arm. On examination, patients will have local tenderness on palpation over (or distal to) the lateral epicondyle and common extensor tendon. Due to the pain, there may be a reduced grip strength, despite a full range of movements at the wrist and the elbow. The diagnosis is typically clinical. Ultrasound or MRI imaging (Fig. 2) can be used to confirm the diagnosis or to detect any structural abnormality, if suspected. Patients should be advised to modify their activities, reducing the repetitive actions causing the condition. Simple analgesics alongside topical NSAIDs should be prescribed to help with the pain. If symptoms persist despite this, corticosteroid injections can be administered, injected into the region around the tendon and can be repeated every 3-6 months. Physiotherapy can provide longer term relief via stretching and strengthening exercises for wrist and forearm extensors. Orthoses (a wrist or elbow brace) can be used in conjunction with physiotherapy for potential longer-term symptom relief. Referrals to an orthopaedic surgeon may be warranted if the symptoms are not controlled through conservative measures. Open or arthroscopic debridement of tendinosis and/or release or repair of any damaged tendon insertions may be required. If the tendon has more than 50% damage, tendon transfer may be required to ensure function is retained. Lateral epicondylitis is self-limiting and spontaneously improves in 80-90% of people in 1-2 years. Medial epicondylitis, also known as ‘Golfer’s elbow’, is a similar condition, affecting the tendons which attach to the medial epicondyle of the humerus (the flexors). In medial epicondylitis, pronator teres and flexor carpi radialis are the most commonly affected tendons. When examining, these patients will have tenderness over pronator teres and flexor carpi radialis tendons and their insertion pain on palpation. The treatment for medial epicondylitis is the same as the course of treatment for lateral epicondylitis, as discussed above.